At 1:23 in the morning on April 26, 1986, nuclear fuel rods at a very high temperature were lowered into cooling water. This caused a very large amount of steam that created extra reactivity in the nuclear core of Reactor 4, due to a design flaw of that reactor. 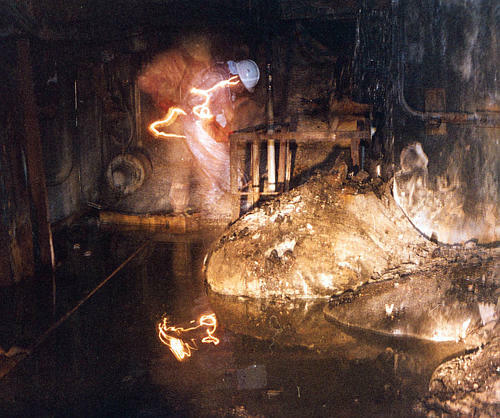 From this came a power surge, creating a huge explosion that dislodged the 1000-ton plate on top of Reactor 4’s core. Radiation was emitted into the atmosphere, and the coolant’s flow to Reactor 4 was severed. Only a couple seconds later, there was another, larger explosion, blowing apart the reactor building. Parts of the core spilled out, sparking fires around Reactor 4. 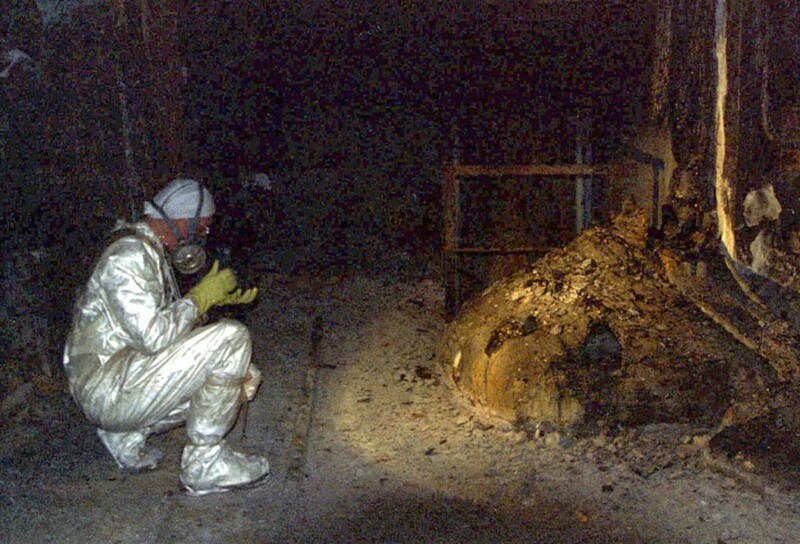 The debris and fires came dangerously close to Reactor 3, which was still operating during the explosions. More than 7 million people were affected by the radiation, mostly those located in Belarus, Russia, and Ukraine. The fuel from the reactor melted and mixed with concrete, sand, and core sealing material in the basement under Reactor 4’s core, eventually forming this solid mass referred to as the Elephant’s Foot. The radiation level on the Elephant’s Foot in 1986 was 10,000 roentgens per hour. What does that mean? Well, in under a minute, any person who approached the mass would take in a fatal dose of radiation. With 30 seconds of exposure, you would feel extreme dizziness and fatigue, even a week or two later. Two minutes of exposure would cause your cells to hemorrhage, and four full minutes of exposure would induce vomiting, diarrhea, and fever. If you were to be exposed for just 300 seconds, you would have approximately two days to live. This makes the Elephant’s Foot the most dangerous piece of waste in the world. Workers didn’t even know about the Elephant’s Foot until six months after the explosions. The emergency crew managed to get access to a steam corridor under Reactor 4. Their detectors indicated that they should not approach a mass around the corner. Using a remote camera, they found the two-meter-wide and 100-ton mass in the next room. They figured no one could approach it for more than a few seconds without facing certain death. So how are there pictures of the mass? Did the worker in the picture above draw the short straw? Sort of, but not exactly. At a (relatively) safe distance, the workers (who were usually called “liquidators”) built a crude camera on wheels and pushed it over to the Elephant’s Foot. The images revealed that the mass wasn’t entirely made of nuclear fuel, but instead only a small percentage. The melted concrete, sand, and core served as a sort of shield from the effects of the nuclear fuel. Even still, workers waited a significant amount of time before attempting to expose themselves to the radiation long enough for a decent photograph. I can promise you that’s no Instagram filter. (I personally think this is the cooler photo, but I don’t get to decide which pictures are considered iconic and which ones aren’t.) There’s only one worker in this photo, and we know by the first photo that there’s no light being emitted by the Elephant’s Foot. That kind of effect makes you wonder what happened to the photographer and the worker. No one seems to know. Best case scenario, they both developed cancer later in life. Their efforts, as well as those of the rest of the emergency crew, were essential to understanding what went wrong in the reactor as well as how to prevent future mistakes. Though their lives were at stake, and though many became incredibly sick from exposure, the workers selflessly put themselves in harm’s way until clean-up and construction the concrete sarcophagus around Reactor 4 (to prevent further radiation emissions) were finished. The enclosure was built to include access points so researchers study the core, but the inside of the sarcophagus will contain radiation for the next 100,000 years. I have seen this picture before, but I never knew the background behind it ! NOW I DO! I think it is so interesting how much a photograph can tell. I can’t believe how dangerous such a small thing could be! I cannot wait to see what picture you choose for next week !!! This is suicide! Literally! I did not know much about the Chernobyl incident, but I am a fan of history, as stated previously; so this information was definitely interesting. The interference in that second photograph is ridiculous! I think this photo also demonstrates how much we have learned about the technology, as that probably would never have been taken by hand (especially with that little protection) today. Oh my god. I’ve done considerable research on Chernobyl tragedy but I’ve never heard of this. That’s frightening and as Jonathan stated, makes quite the statement to humanity’s potential for destruction. I couldn’t even imagine being in the vicinity of that. I’d be too afraid. Another amazing post as always Hannah. Fantastic work! I agree with JP. I think that, going along with human-caused issues, that it is just amazing to see how stupid we can be. I know that as of recent it has been discovered that due to drilling humans are capable of even causing earthquakes! Good read! I enjoy learning about new things! That is a terrifying story. I do feel indebted to the men photographing the ruins of the reactor, especially because they are all probably dead. They were certainly braver than I could ever be. This was quite eerie and terrifying to read, haha. But I enjoyed it for one reason; and that is the fact that I know absolutely nothing about nuclear engineering. This is a subject that I have always been interested in yet have never tried due to my lack of science knowledge and pure hate of math. But I liked the history/facts aspect of this! 100,000 years is a… long, long time. I think it really stands as a testament to just how destructive mankind can be, as we have left a lasting (and quite negative) impact on this planet for 100,000 years just with this “creation” of ours. And I sincerely doubt the concrete sarcophagus around Reactor 4 will last the 100,000 years the radiation is expected to. It also makes me wonder if people will be around, at least in a similar sense as we are today, in 100,000 years. 100,000 years is a… long, long time.